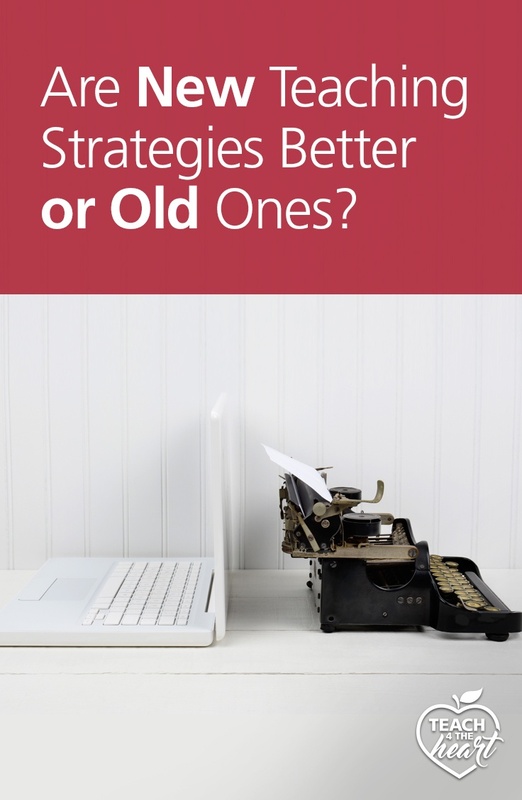 >> Are New Teaching Strategies Better or Old Ones? Some teachers tend to embrace new ideas and strategies while others cling to old ones. But the truth is that we shouldn’t judge an idea based on its age. Join us as we discover that the most effective classrooms are a wonderful combination of the best new ideas and the most effective old ones. "Guide on the Side" v "Sage on a Stage"
Some of us naturally gravitate towards new ideas and are excited to implement them, while others of us hesitate - worried that the new idea will be less effective than older techniques we considered tried and true. The truth is that we need a healthy combination of new, innovative ideas and tried-and-true techniques in our classrooms. So we shouldn't judge an idea based on its age but instead examine the idea itself - considering the philosophy behind it and the evidence for (or against) it - and being willing to try new (and old) strategies to see if they improve our classrooms. Each of us naturally falls more towards one side or the other (either quick to adopt new ideas or more apt to stick with older ones). So let's examine each "side" to discover why we feel the way we do, and what mindset shifts we need to make to be open to the best ideas possible. why do we hesitate about new ideas? Sometimes we have good reasons to hesitate. We might be worried that we'll be abandoning tried-and-true techniques for something unproven. Maybe we're remembering some really bad trends and ideas that have come down the pipe (there sure have been some doozies!) and we're concerned these new teaching strategies are no different. Or maybe there's legitimate concerns about the worldview of an idea - because, honestly, some educational trends and philosophies come from a secular worldview and are quite compatible with a Biblical one. But while there are legitimate reasons to be cautious, let's also realize that sometimes our motives aren't quite so pure. Sometimes we just don't want to change. We're comfortable with what we're doing. It's working for us. And the thought of overhauling and reworking it is simply overwhelming. TRUTH #1: We are now teaching in a new age - the Information Age. I'm sure you realize things have changed dramatically in the past twenty years, but have you ever stopped to consider that we are literally teaching in a new era? As such, we cannot afford to be nostalgic and stubbornly insist on teaching the same way teachers taught fifty (even twenty) years ago. Why? Because back then we were still in the Industrial Age, preparing students for jobs where they simply have to remember things and follow directions. The world is completely different now, and students need different skills - particularly the ability to think critically, be creative, and communicate well. Does that mean we throw the baby out with the bathwater? Absolutely not. But we have to realize that we are in a new age, and that education, by necessity, has to change to fit our new era. TRUTH #2: There are lots of fantastic new ideas. Yes, there are doozies out there - and we need to be on the lookout for them. But there are also so many amazing ideas, and the internet has made them more accessible than ever. So don't be afraid of new ideas. Look for them, experiment with them, try out the great ones and leave the not-so-great ones. Yes, they take time and energy to implement, but when you see how much better your classroom is, you'll know the change was worth it. why do we dismiss old ideas? Some of us love new ideas but tend to dismiss older ones. Maybe we consider them old-fashioned and out-dated. We see that times have changed and that we need to innovate, and we don't see much place for the teaching strategies and techniques of yesteryear. But while innovation certainly is important, is it possible we're sometimes too quick to dismiss more traditional techniques? ​TRUTH #1: Certain principles don't change. They're universal. While times have certainly changed, many principles don't. That means that the past still has a lot to offer us. And while certain practices may indeed be ineffective or outdated, others are based on sound principles and can be just as effective now as ever, especially when they're tweaked and updated. TRUTH #2: New doesn't always equal better. New is always more exciting, but that doesn't necessarily mean it's better. Sometimes we innovate for the sake of innovating - or add tech for the sake of adding tech - and the result turns out to be something less effective than before. Does this mean we should stop innovating? Absolutely not. But we should be honest and aware enough to recognize when a newer trend simply isn't working as well as the older technique - and revert back when needed. So what exactly is the point? Namely, that we should judge ideas (both old & new) based on the merit of the idea itself, not on its age. We need to be open both to current trends and to time-tested techniques and incorporate the best of both worlds in our classrooms. Beyond that, we need to value the experience and opinions of those at our school who are on the opposite end of the spectrum from us. They provide a different perspective, and, chances are, we could learn a lot from them. That means that if you love to stick with what's worked well for you in the past, you shouldn't get annoyed at the teachers who keep trying new things. Instead, talk to them, ask them what they're doing, and pick out the idea that sounds most promising to try in your classroom. Likewise, if you consider yourself an innovator, choose not to be frustrated by the teachers at your school who tend to be more traditional. Instead of viewing them as dinosaurs who refuse to change, get to know them, ask them for advice in areas where you're struggling, and you might just be amazed at the wisdom you receive. Because the truth is that we need both new innovation and time-tested principles to create the best classrooms possible. And when we work together, appreciating each others' view and experiences rather than letting the differences frustrate us, we just might be amazed at the culture we create. looking for a place to share ideas? Join us in our Facebook group for great discussion, camaraderie, encouragement, and ideas. Join the Christian Teachers' Lounge Facebook group. A thought-provoking article that provides valuable insights. The Age of Information Technology is flourishing, causing an influx of EdTech tools that make the learning process convenient and expansive for students. EdTech tools make education fast-paced, too, and they can be very effective. 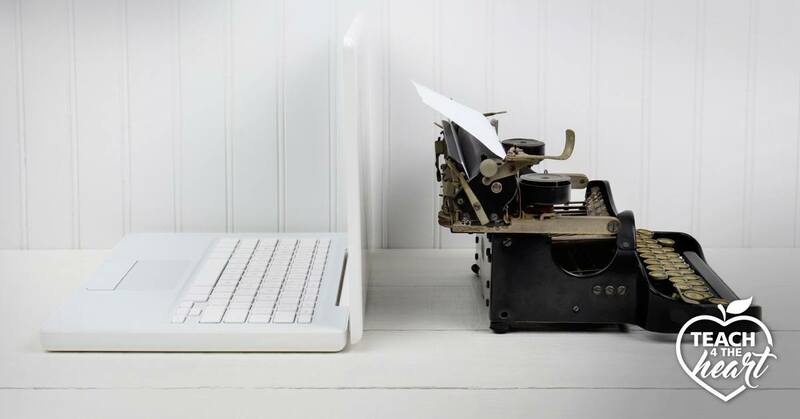 However, old-fashioned ideas are worth incorporating into the EdTech classroom as well, especially when it comes to infusing the human element in the education process.